It is a collection of interrelated data and set of programs to access the data from database. It is a suit of software programs for creating maintaining the data in the database. 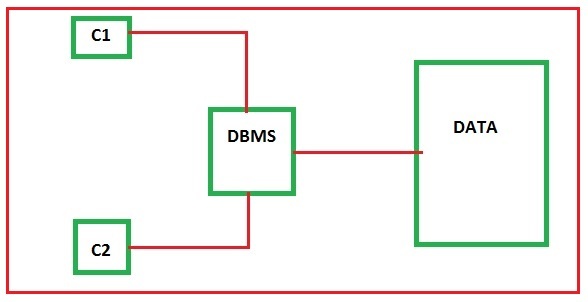 Users are connected with DBMS not with the data. It allows the organisation to store data in one location from which multiple users can access the data. user can insert, update, delete the data by using tools provided by DBMS. For example think s1,s2 and s3 are the stores and p1, p2 and p3 are the parts. Data is organised in the form of a tree structure. Drawback is data redundancy and wastage of memory. The drawback in hierarchical model is rectified. No data redundancy and no wastage of memory. It uses the collection of tables to represent the data and to establish the relation among the data. Data is stored in the form of tables. The intersection of row and column will give one value. High security for the data. It supports any type of data like numeric, char, date binary etc. Multiple users can access the data from any location. No physical link among the data. 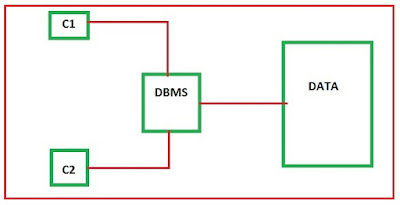 RDBMS: Based on relational model is called Relational Database. It is suit of software program for creating, maintaining and manipulating the data in relational database. Ex: Oracle, SQL Server etc. Oracle can run on any platform while SQL Server runs only on windows.